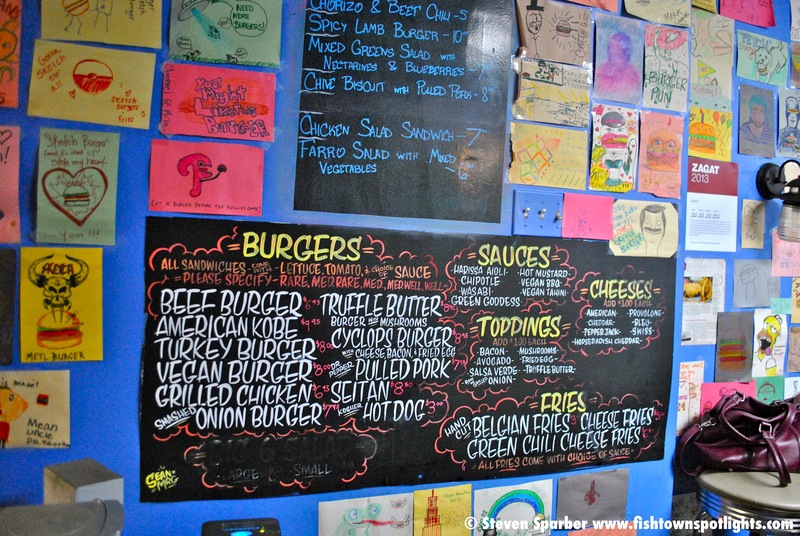 Phyllis Farquhar, owner of Fishtown’s Sketch Burger, has made it her goal in life to simplify. “That’s what I try and do everyday,” she said in our interview. “I do the best possible work in the simplest way.” If you’ve been to Sketch, you know this philosophy holds true for her restaurant—the burgers are simply delicious. This philosophy shows up in other ways at Sketch. When you walk in, what you see is what you get, and there’s a lot to see. You won’t find paintings or designs by local artists. No marble columns or fancy fountains here. Instead, you’ll find a much more down-to-earth, yet wildly expressive element in the environment—a very “unique” type of wallpaper. 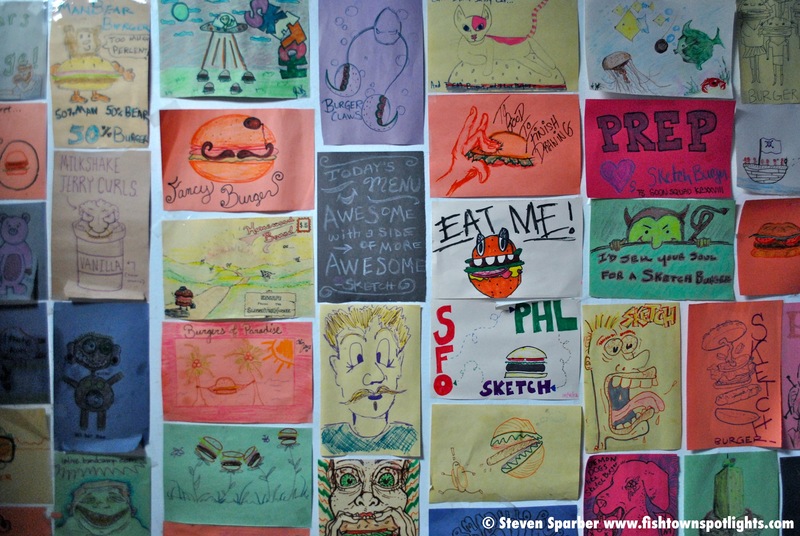 The walls are a mosaic of colorful drawings created by Sketch customers, both kids and adults. Hilarious, cute, scary, fun—the range of style and subject matter you’ll find in these works of art are as diverse as the human imagination. Sketch has mastered the art of the burger. Take a look at the menu, and you know you’re in for an unusual treat—buns from Le Bus Bakery; a variety of sauces including chipotle, wasabi, hot mustard and tahini; and different types of burgers: beef, kobe, turkey, vegan, chicken, onion. The first bite is the best. Somehow you know, even though it’s just a burger—a food identified with diners, drive-ins, and dives—refinement and culinary experience went into it. I had a chance to find out more how Phyllis created such a unique personality for Sketch, and why the food is simply so damn good. How did you discover your interest in food and cooking? I came from a family that shopped and cooked everyday. We were in the European tradition, and never saw a can or frozen product in our house. We always ate together as a family, breakfast and dinner. You communicated, you ate together, and you waited for your father to come home. Those meals were important—they were the cornerstone of our day. I grew up in New York, and New Yorkers are all about food. When I was growing up, you could work as a child, so I started working in restaurants when I was 14 or 15. I met a few different French chefs, and worked catering and pastry. They taught me the importance of simple food, and how amazing a simple piece of meat could be, or how delicious potatoes are by themselves. They were a really big influence on my life. I cooked through high school and college, and supported myself through graduate school. That’s the great thing about having the skill of cooking—you can go anywhere and do it. What is your approach towards making food and running a restaurant? Simple is best, but simple doesn’t mean easy. Simple means procuring the best ingredients from the best vendors, and constantly tasting the food to make sure it’s as flavorful as possible. I’ve eaten in a lot of restaurants and wondered, “Is anybody tasting this food?” Many chefs try to make food overly complex. Really, everything starts with the ingredients, which is much more important than the talent of the cook. If you get a fantastic ingredient, and do as little as you can to it, you preserve its integrity. Customers appreciate this. It’s my hope that when they bite into their burger, they realize how special the meat is. What is the most satisfying part of your job? When people leave happy. Sometimes people will stop me in the street and tell me how happy they are because of a meal they had at Sketch and say great things about my employees. It’s very satisfying to know you’re making somebody happy with the simplest thing. It’s also satisfying to give someone a paycheck, which extends beyond the employees here at Sketch. It extends to the employees of our vendors, and in its own way contributes to the local economy. What is your favorite food? Seafood! Grilled octopus, raw oysters, calamari, fish. When you’re around burgers and meat all day, you want anything but! How does the artwork created by Sketch’s customers contribute to the overall appeal of the restaurant? It makes people smile. When a customer comes in here for the first time, they make the connection to “Sketch”. I felt that the best way to create our atmosphere was to let it be customer-driven, and I found that people are extremely talented. The artwork amuses everyone who walks in here. There are plenty of galleries, coffee shops, and restaurants with loads of pretentious art. This art isn’t pretentious—it’s real. I also wanted to give people something to do while they’re waiting for their food, instead of being buried in their cell phones. It can be disheartening to see a table of people not communicating, everyone busy on their phones. I find that if you give them paper, markers, and crayons, finally they’re communicating again and acting like human beings. It’s fun for both kids and adults. 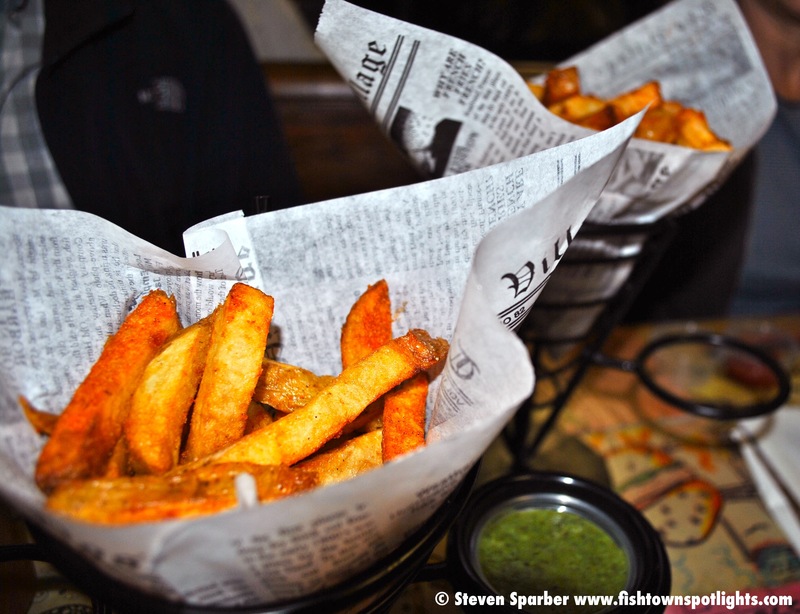 Why has Sketch Burger become a Fishtown favorite? It feels like a perfect fit—the warm personality, the fun atmosphere. Every type of person comes here, every ethnicity, age group, income. It’s friendly and it’s relaxed. Fishtown’s kind of hard to define now because it’s getting more multicultural. I guess it has something for everybody, and so do we. I’ve been part of this community for 13 years, I live right down the street. People in Fishtown feel comfortable with Sketch because they know me, and they know I’m always here. They know that the owner cares. 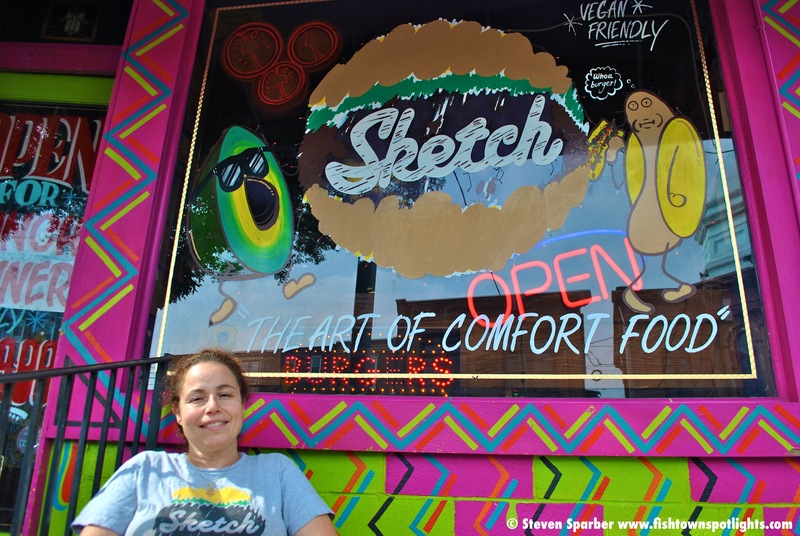 Sketch Burger is located at 413 East Girard Avenue. Visit the Sketch Burger website for more information. 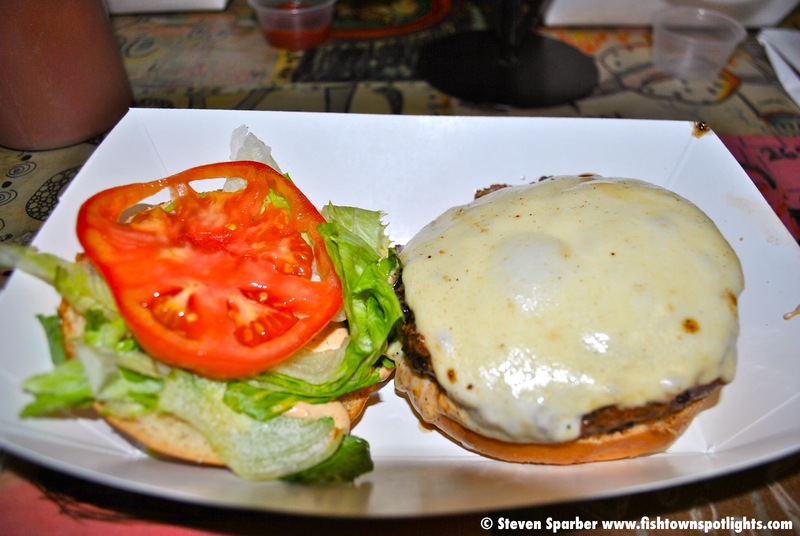 This entry was posted in Categories, Food & Drink and tagged fishtown, girard avenue, le bus, philadelphia burger, philadelphia food, phyllis farquhar, sketch burger by fishtownspotlights. Bookmark the permalink.